I got some great new pants, from Stitch fix. I call them miracle pants, and I do believe they could change the world. For better. I was doing laundry, my dress pants and tops for work mostly. Washed all the dark stuff together on gentle, as usual. Grabbed my pants out of the wash, and checked the tag to see if I could dry them. There were no written instructions…. just a weird jumble of stick drawings that I assume was supposed to mean something to me. Nothing. This means nothing to me. I called my best friend who doubles as my recent sub-par girl scout cookie supplier… asking if she had any idea what the little pictures mean on the tag of my pants? Nope. Happened to her, and she had to Google it. Are we really supposed to know this? Is the book of laundry hieroglyphics sitting somewhere for us to learn from? All I can glean from this tag is something about temperature-in Celsius of course, something about ironing them…I assume it’s ok?? And something about avoiding circles. Or holes. Maybe don’t throw your pants down a hole? Don’t cut circles in your pants? 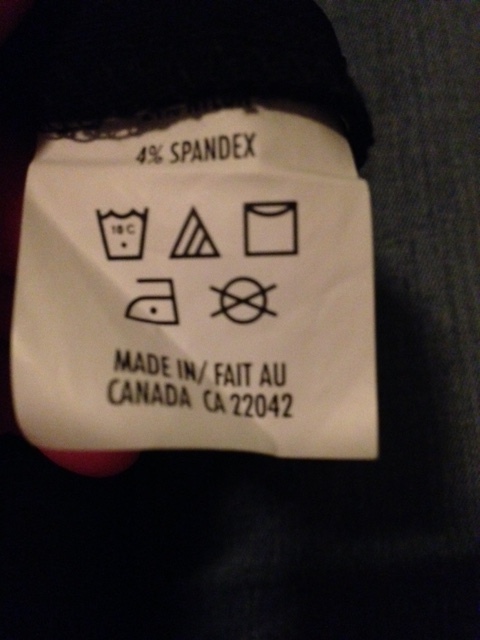 These are made in Canada, not ancient Egypt! I did not take the laundry tag class in home economics, I am not sure it was offered. It seems pretty ballsy for someone to just assume the world at large is going to know what to do when faced with this tag. I feel like the triangle with stripes might mean something important. How do I know?? So I Googled it too. Holy hell, it’s like cracking a code. Check it out here. It’s amazing how much information can get jammed onto that little tag. And a little sad that I dried the pants on super low, after crossing my fingers. Now that I know better. LINE DRY!! It means line dry! How would I possibly know this? It looks like an envelope, or a box to me. This has nothing to do with Pink Floyd, and everything to do with using non-chlorine bleach. If you must. No one is trying to save you from falling down a rabbit hole, or illustrating chop sticks on an empty plate. It means NO dry cleaning. Geez. It should not be this hard to wash your clothes. This entry was posted in humor and tagged clothes, laundry, laundry guide, laundry symbols, laundry tag symbols, washing clothes. Bookmark the permalink.